Shiva Keshavan, is competing in luge as an individual Olympic participant. India was suspended by the IOC. Did you know that Keshavan's training area is a highway in the Himalayan mountains? Not much choice when your country is under suspension. At least he had a good mountain to train on and what a view. From Luge to a Bobsled member from the US. 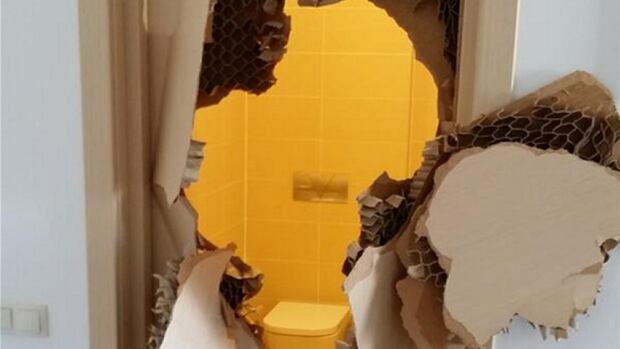 American bobsledder Johnny Quinn took matters into his own hands on Saturday when he got stuck in his Olympic village bathroom after locking himself in — smashing a huge hole to break out. The former American football wide receiver, at his first Olympics, posted a photo on Twitter of the door after he had smashed through it, with the hashtag #SochiJailBreak. "I was taking a shower and the door got locked/jammed," Quinn, a push athlete on the USA-2 four-man sled, wrote on his Twitter page @JohnnyQuinnUSA. Bizarro's comic for Saturday was about the Olympic Hide and Seek Competition medals-gold for Sasquatch, silver for Loch Ness Monster and bronze for Waldo of Where's Waldo fame. Waldo was holding onto a wooden cane. You might not be able to get medical care in Sochi--it depends on fees and who is supposed to provide care for visiting tourists and athletes and if you can overcome the lack of English directional signs to city hospitals or pharmacies. Ensure you have a Russian speaker with you to help you confirm what can or cannot be done for you. Canada, Netherlands and Norway are tied at 7 medals apiece but Canada has more silver medals. Online shopping for Olympic gear? Be wary-fakes may be sold. I have read that snowboarders are not happy with the conditions of the halfpipe course. Why it's a good idea to know your sport's competitors-networking potential! Despite his past achievements, some members of the new generation of curlers don’t know much about him. Canada skip Brad Jacobs said before the Olympics that he barely knew Germany’s team. Sweden skip Niklas Edin had a blank look when Jahr’s name was mentioned. He was then informed that Jahr is a millionaire. “Now I will get to know him!” Edin said. But critics charge that the law was less about protecting kids, and more about retaliating against the U.S. for a law banning Russian human rights violators from American soil. The U.S. State Department labeled the law, “politically motivated.” Both UNICEF, the U.N.’s child welfare agency, and Human Rights Watch condemned the move. I wonder how many training runs on the course he got in Sochi prior to the actual competition? Snow is better than highway! Did you know there's a rat to predict hockey game outcomes? A pair of otters are also being used for predictions. The CBC at times is a joke in Canada, other times we love them. This time it's Toledo, Ohio's turn to love the CBC. It all began because NBC and the local station could not agree on retransmission fees so NBC pulled the plug on the Olympics. Toledo is having the last laugh, thanks to CBC and I think they may keep tuning in after the games are over. Cable subscribers in Toledo, Ohio, are singing the praises of Canada and CBC’s television coverage, after a dispute with a local affiliate blocked broadcast of the Winter Olympics in Sochi. In a 30-second commercial residents thank Canadians for coverage of the Olympics to the tune of Oh Canada. “CBC we’ll tune our sets to thee,” concludes the spot, which has been running regularly since the games began Feb 6. Russian Olympic skicross racer Maria Komissarova underwent six-and-a-half hours of spinal surgery on Saturday after breaking her back in a Sochi 2014 training crash. The 23-year-old had a metal implant inserted and surgeons said they would not know how successful the operation had been for three or four days. Her condition was serious but she was in a stable condition, the Russia Freestyle Skiing Federation said, adding that she was likely to be taken to a Moscow hospital or go abroad for treatment when it was possible to move her. While some are hoping she will ski again, I think the hope should first be that she can eventually walk. It's a serious injury and will take a long time to heal. When she is stable, it's probably best she leave Russia for the best recovery treatment possible. One of the big hits in Sochi, a red Beer Fridge that only can be opened by a Canadian passport. Most Canadians know about it, but have only seen it on ads, now Sochi joins the list of European cities that have hosted the fridge. France, Belgium and U.K. locations were first. Once it leaves Sochi, no one knows where it the world it will show up next. A big hit at Canada House and a gold mine for Molson's promotion of Canadian beer. It may be the most famous household appliance in Sochi. 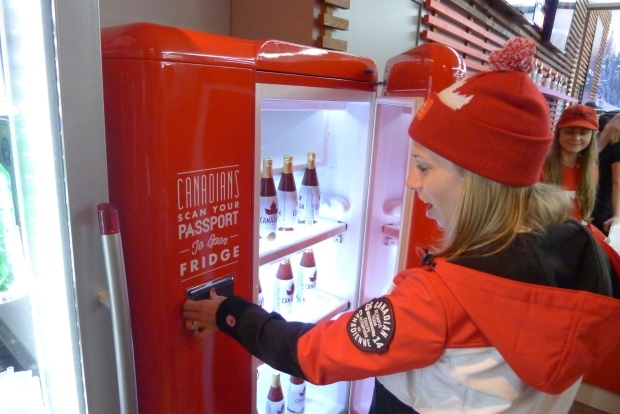 A red beer fridge, which requires a Canadian passport to open, is an Olympic hit. Team Canada defenceman P.K. Subban, long-track speedskater Lucas Makowsky and Olympic champion freestyle skier Alex Bilodeau are just some of the Canadian athletes to drop into Canada Olympic House to check out the fridge. Canadian actor Nathan Fillion recently gave it a plug on "Jimmy Kimmel Live." Jacques Rogge, former president of the International Olympic Committee, even gave it a once-over. Canada will go for gold in Olympic women's hockey after a 3-1 win over Switzerland in Monday's semifinal. Canada and the United States will meet Thursday in the Olympic final for a fourth time. The Canadians have won three gold in a row at the Winter Games. The U.S. beat Sweden 6-1 in the earlier semifinal. same, since that is what most want to see.